Just about everyone knows the basic goodness of graham crackers. Made with honey and graham flour, we grew up eating them as snacks, more fancifully as S’mores and now we know them as the main ingredient in crusts for cream pies and tarts. 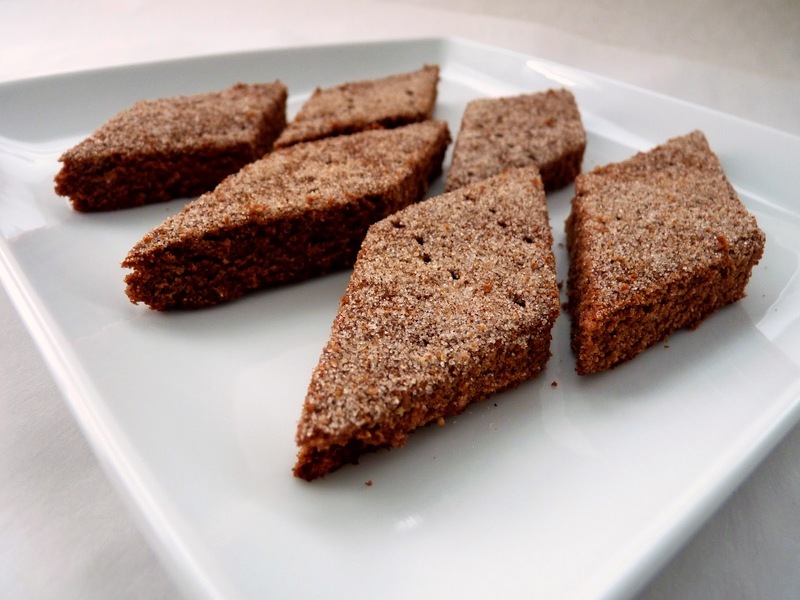 There's a recipe for Chile-Cocoa Graham Crackers from wondrous pastry chef Alice Medrich featured in Eating Well, a magazine dedicated to promoting healthy eating and cooking. 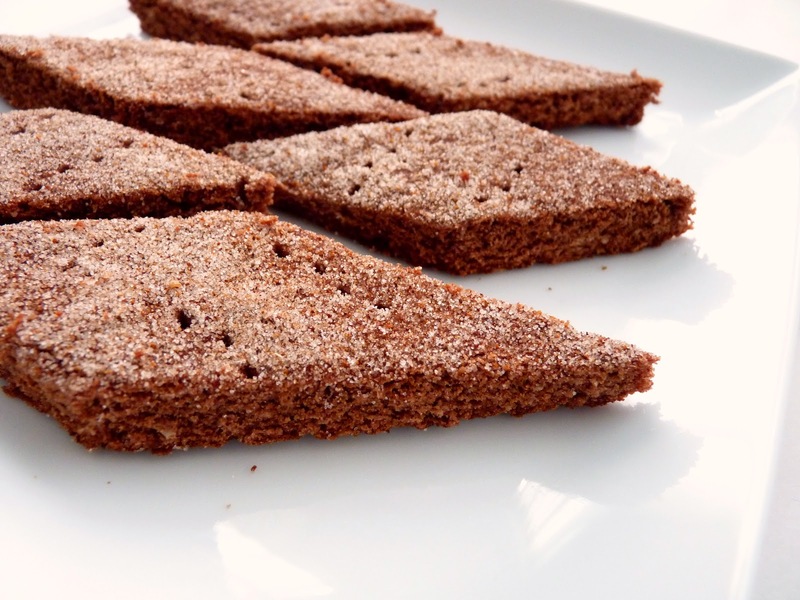 It’s a recipe that takes the familiar graham cracker into a more adult realm while trimming back some of the ingredients for a healthier approach. 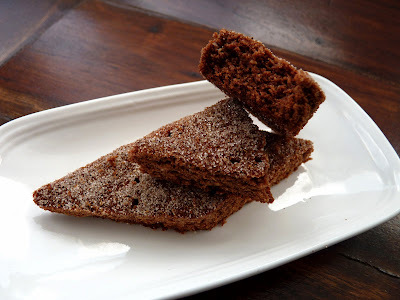 What also makes it unusual is Alice’s brilliant flair for cocoa and cookies and her idea to add chile powder to the cinnamon sugar sprinkled on top. It’s a great spicy note with the cocoa and really changes the whole basic idea of a graham cracker for the better. It’s a very good cookie that’s certainly lower in fat and sugar but I must confess that I couldn’t stop wondering how it would taste if it weren’t quite so healthy. Now that’s something I never do but since it seemed to hover at the back of my mind for so long I finally set about trying to make her fine work just a little more decadent. Odd, I know, but there it is. Here is my revision, just for fun. They're just slightly sweeter and richer but still quite good. I love her idea for something so rustic yet somehow sophisticated. - Alice Medrich recommends natural cocoa rather than Dutched, although either type may be used. 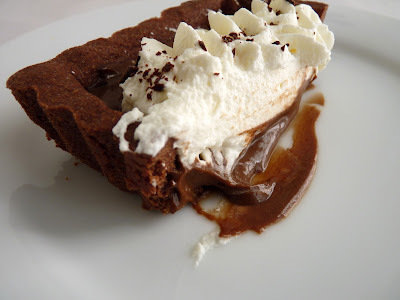 - I added a pinch of smoky chipotle powder to give the topping just a tad more depth. - This cookie is baked in a solid sheet of cookie dough and then sliced after baking, rather than cutting or shaping the dough into individual cookies. They do crisp up after cooling but depending on how evenly you roll out the dough, the crispness may vary. If they’re not as crunchy as you’d like after they've completely cooled (the center ones may be softer), simply place them on a parchment-lined baking sheet and toast for about 10 minutes. Watch them closely to avoid burning. - I used a sharp serrated knife and a sawing motion to slice the cookies. - Store cookies in an airtight container. - Do yourself a great favor and stock up on Alice Medrich cookbooks. Her work is meticulous, in a class by itself. Place the flour, cocoa, sugars, salt, baking powder and baking soda in the bowl of a food processor and pulse until thoroughly combined. Add the pieces of butter and pulse until the mixture resembles cornmeal. Whisk milk, honey and vanilla together and drizzle over the flour butter mixture. Process just until the dough forms clumps and holds together when pinched. Place the cookie dough onto a sheet of parchment and press it together into a flat rectangle. Put a piece of plastic wrap on top and roll the dough out evenly to about a 10” square. Place on a baking sheet and refrigerate until thoroughly chilled. Preheat oven to 350 degrees. For the topping, combine the sugar, chile powders and cinnamon. Take the cookie dough from the refrigerator and remove the plastic wrap. Prick the dough all over with a fork. Sprinkle the dough lightly with just a tiny bit of salt. Dust the dough evenly with the spiced sugar. Even up the edges of the cookie dough with a sharp knife but leave the edge scraps in place (for nibbling and to protect the rest of the grahams from burnt edges). Bake until the cookies just start to brown around the edges, 20 to 25 minutes. The cookies will continue to crisp up as they cool. Cool the pan on a wire rack for 10 minutes. Cut into desired shapes and sizes. If there are any cookies that are too soft, return them to a 325 oven for about 10 minutes to crisp them up. Bar cookies are phenomenal. They’re chewy and moist and super easy to prepare. The mixing and layering are usually pretty forgiving, so there are endless combinations of ingredients to play with, which means you can usually wind up with something that’s totally in your wheelhouse. I happened to have some coconut left over from another project and remembered that I wanted to try a recipe for a bar cookie from Gourmet. 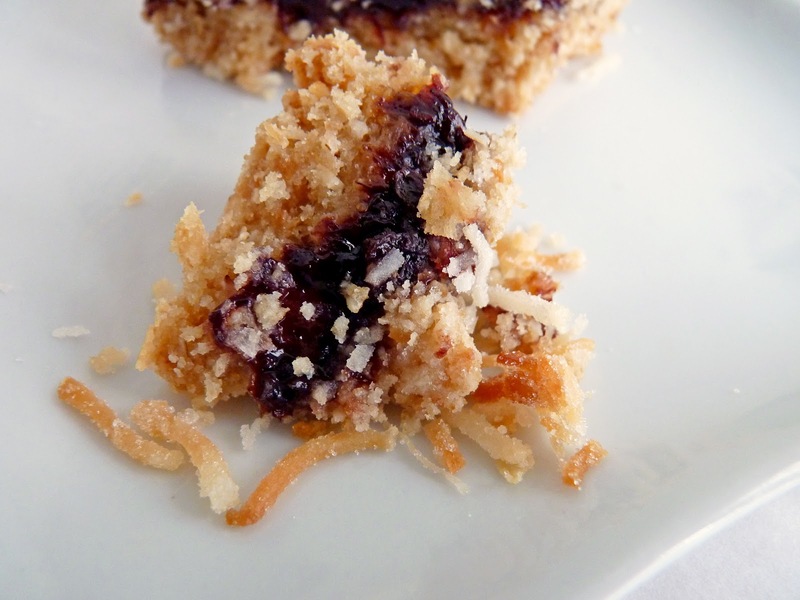 It has oats and coconut in the base and topping, which adds to the flavor and texture, along with a layer of fruit jam. 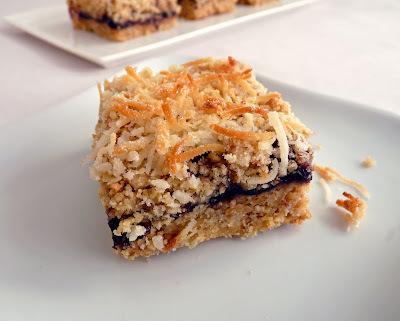 I loved the basic idea but I wound up completely revising the recipe because I didn’t want quite so much coconut and I wanted something less sweet. I also added some leavening and vanilla to the dough and changed the size of the baking pan, as well as baking time and temperature. This particular combination of ingredients produces very good results from a few simple ingredients. The cookies seemed to vanish as soon as they cooled, always a good sign of success. - The original recipe called for baking the bars in a 9” x 13” pan at 375 degrees. I made them in a 9” square pan because I wanted a thicker bar. I also lowered the temperature and baked them at 350 degrees for 35 minutes. - I used less coconut and I cut back on the sugar by half, using equal parts brown and granulated sugar, and thought they were plenty sweet. - Some of the coconut is toasted and mixed into the dough. The rest of the coconut is sprinkled on top and is left untoasted. Coconut toasts quickly in just a very few minutes and can burn in a blink of an eye, so keep a very close eye on it. - I used homemade blackberry jam and sprinkled fresh raspberries on top of that. I really loved how the fresh berries brightened the flavor with a touch of acidity. - I think any sort of your favorite fruit jam would be a good substitute as long as it’s a natural brand that isn’t too sweet. 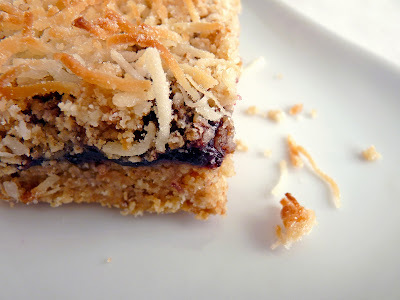 - One of my favorite bar cookies is Fig & Chocolate Oatmeal Bars. Preheat oven to 350 degrees. Lightly grease an 9” square pan and line with a piece of parchment paper large enough to form an overhang along two sides of the pan. Spread 3/4 cup coconut evenly on a baking sheet and toast until light golden brown, about 4 – 6 minutes. Keep a very close eye on it because coconut can burn very quickly. Stir as it toasts if it looks like it’s not browning evenly. Cool. Place flour, baking powder, sugars and salt in a food processor and process to blend. Add oats and toasted coconut and pulse a few times to combine. Add butter and vanilla and process until a dough begins to form. Press 2/3 of the dough firmly and evenly into bottom of the prepared pan. Spread a layer of jam over the dough (and distribute fresh raspberries over the jam, if using). Crumble the reserved dough evenly over the fruit layer, then sprinkle with remaining 1/4 C untoasted coconut, pressing down gently to secure. Bake until light golden brown, about 35 minutes. Cool completely in pan on a wire rack. Run a knife around the edges and, using the parchment paper overhang, lift gently to remove. Cut into squares. It’s always the season for chocolate. And the more chocolate cake you try, the more you come to realize there are a number of routes to travel when searching for the ultimate bite. 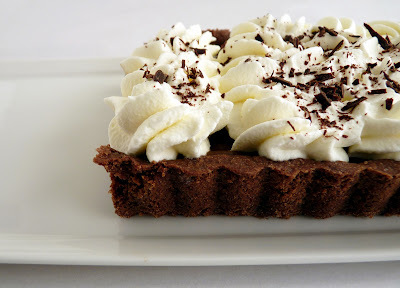 I’m always looking for the deep flavor of cocoa not masked by too much sugar; the perfect texture that is neither too soft nor too toothy; a soothing balance of crumb and moisture in each bite; a wondrous hit of chocolate without being too rich or overwhelming. These are the elements that - depending on the quality of ingredients, technique, method, baking time and temp - conspire in different ways to fulfill that dream chocolate cake experience. Sometimes you want the lightness of a genoise and sometimes you want the perfect balance of Devil’s Food. Or sometimes you want the deep charge of a flourless concoction or the density of a pound cake. And then there’s everything in between. Which brings me to today’s chocolate cake. This is the famous recipe from Epicurious, Double Chocolate Layer Cake. 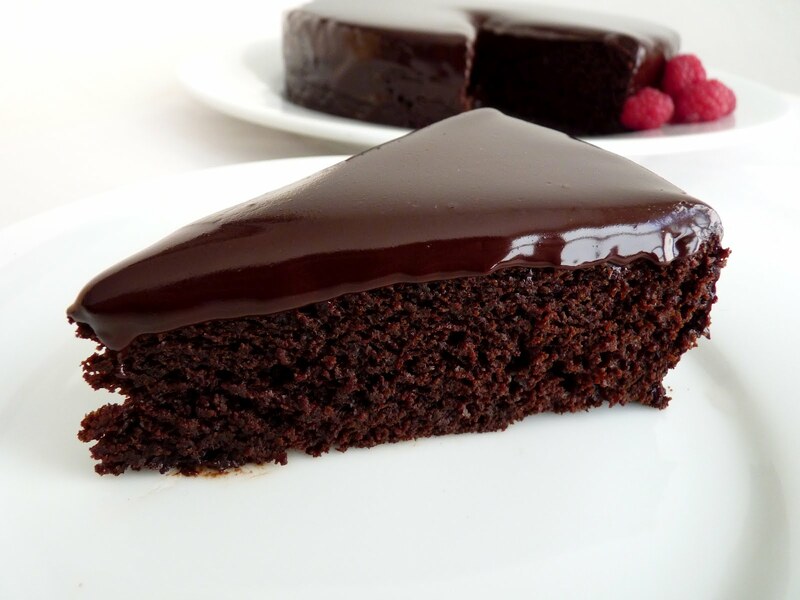 I’m tempted to call it Chocolate Heartthrob Cake because it’s so superhumanly popular with mostly positive reviews from over 1,400 readers. Since I’d never tried it, I thought I would see what everyone is talking about. Well, to begin, this is a massively huge 10” cake that would serve 14 - 16, so I scaled back the ingredients to bake a single 8” layer. The cake is very easy to make. It has a little semisweet chocolate bolstered by natural cocoa for a fairly intense chocolate bite. It’s made with oil rather than butter, so you can expect it to be moist with an open crumb. And the very odd part is that it’s baked at 300 degrees for a longer period of time, but it works. 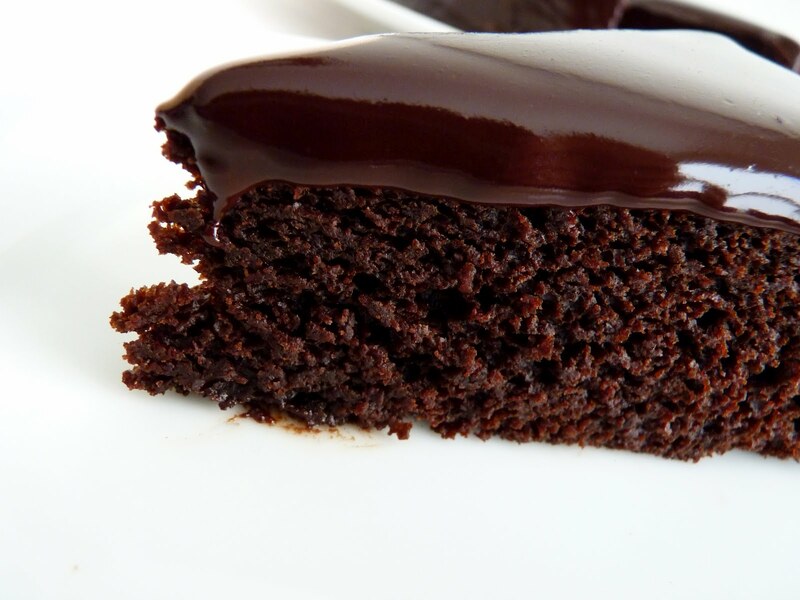 This is a very rich, very moist cake. It wasn’t quite there for me on the perfect texture side of the equation. I thought it was almost ever so slightly too moist, if that’s even possible to understand. But the flavor is very good and everyone who tasted it loved it, so it’s definitely easy to see why it’s gotten so much adoration. It will be another very good chocolate cake in my arsenal of good chocolate cakes. So off we go. Let’s bake some cake. - Do take note: the oven temperature is not a typo. The cake bakes at 300 degrees fahrenheit. - I first whisked the one egg in the bowl by hand to aerate it and give it some volume so it would be viable on a stand mixer. 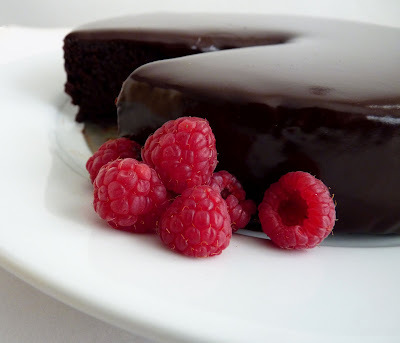 - The original recipe calls for a rich chocolate ganache to finish the cake but I used a looser chocolate glaze for a lighter, creamier result. You can use bittersweet or semisweet chocolate, depending on your own desired level of flavor and sweetness. Or you can use half bittersweet and half semisweet. - For the chocolate glaze, finely chopping the chocolate into small bits ensures it will melt more evenly and efficiently. When the hot cream is added, let it sit for about 2 – 3 minutes so the chocolate can absorb the heat. Then stir gently and slowly, starting in the middle and working outward in concentric circles, to prevent it from cooling down too fast and creating air bubbles. The glaze can be reheated over a low simmering bain marie. When it's ready, flood the center of the cake quickly and then move to the edges. - You can also bake this in a 9” pan for about 38 - 40 minutes. Or make cupcakes and bake for 22 – 25 minutes. Preheat the oven to 300 degrees fahrenheit. Grease the bottom and sides of an 8” x 2 1/2” cake pan and line with a circle of parchment. Finely chop the semisweet chocolate and place in a bowl. Pour the hot coffee over it and let it stand for a minute or so. Whisk until the chocolate is melted and the mixture is smooth. In another bowl, sift the flour, cocoa powder, baking soda, baking powder, salt and sugar together. Beat the egg at medium speed until it is pale yellow, about 1 minute. Add the oil, then the buttermilk and vanilla and beat until thoroughly combined. 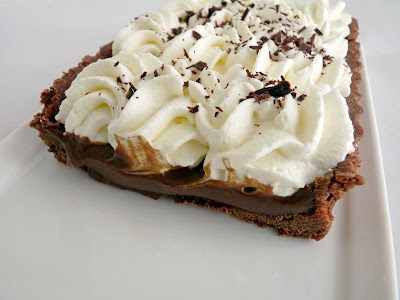 Mix in the melted chocolate and coffee mixture. Add the dry ingredients all at once, and beat on low speed until the batter is just combined. Using a rubber spatula, scrape down the sides and bottom of the bowl and stir to make sure all the dry ingredients are absorbed. Pour the batter into the prepared pan. Bake for about 45 minutes, or until a toothpick inserted in the center of comes out clean. Cool the cake in the pan on a rack for 10 minutes, then turn it out onto an 8” cardboard round or removable tart pan bottom. Carefully peel off the parchment paper and cool completely. Place the cooled cake along with the cooling rack on a baking sheet lined with parchment. 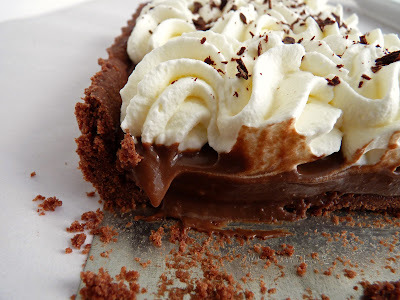 For the chocolate glaze, finely chop the chocolate into very small pieces and place in a medium bowl. Bring the cream and corn syrup to a simmer. Keep your eye on it because it will spill over if left unattended. Just as it begins to boil, take off heat and pour it over the chopped chocolate and let it sit for about 2 minutes. Then stir slowly and gently, starting in the middle until thoroughly combined and then working outward in concentric circles until the mixture comes together. 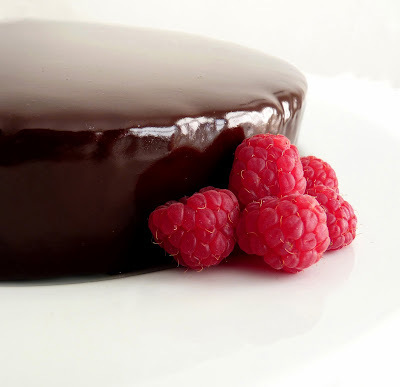 To glaze the cake, pour the glaze quickly in the center of the cake and then around the edges. Let it run for a few seconds and then gently jiggle and tap the baking sheet on the work surface to encourage the glaze to run down the sides of the cake. Just as it begins to dry, run a small flat spatula around the underside of the cardboard round to smooth the bottom edge and prevent “feet” from forming. Let glaze firm up before serving.